The Census Bureau released its annual report on income and poverty in the U.S. this week. At first glance, the news seems positive -- the poverty rate in the U.S. has dropped for the first time since 2006 and child poverty has declined for the first time since 2000. One statistic, however, points us to a growing problem for the working poor. 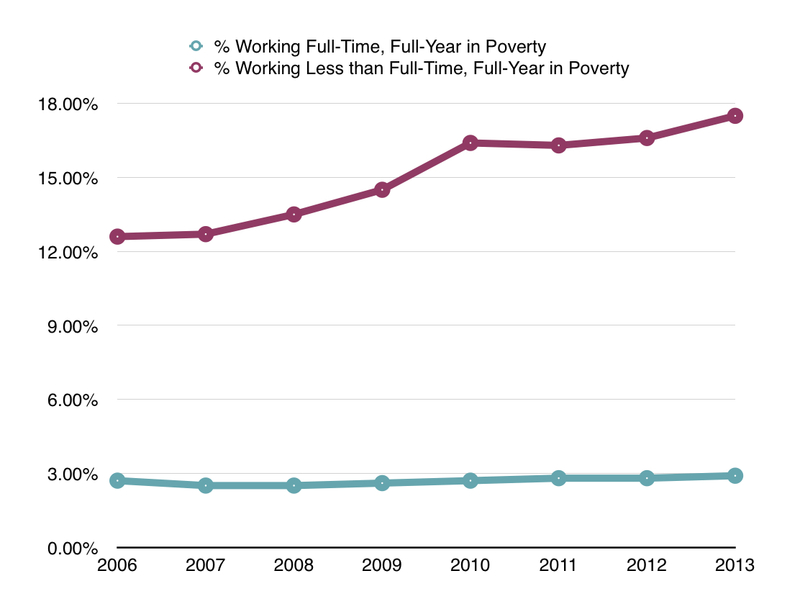 One of the only groups to show higher rates of poverty in 2013 than in 2012 is those who work less than full-time year-round. The poverty rate for this underemployed group increased from 16.6 percent in 2012 to 17.5 percent in 2013. 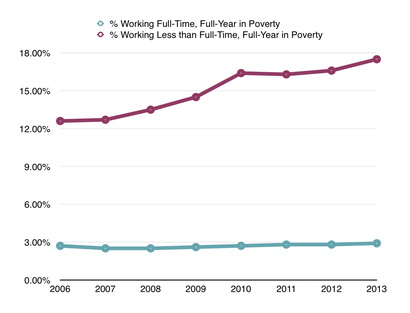 In contrast, workers employed full-time, full-year show poverty rates of only 2.9 percent. In fact, the chart below shows how drastically the poverty rate for underemployed workers has increased since 2006. What does this mean? Those who are underemployed -- working less than full-time, full year -- are over six times more likely to live in poverty than those working full-time, full-year. It means more kids living with stress and insecurity, more parents taking on multiple jobs. It means that making ends meet by working hard is slipping further and further from reach for a great number of American families. In fact, the underemployed represent just over 32 percent of all workers age 16 to 64, a sharp increase since before the recession when only 27 percent of all workers worked less than full-time, full-year. There is a 'new normal' in the labor market, where many low-wage workers are still getting too few hours and too few opportunities for advancement into good-paying full-time jobs. Rose is a mom living in Detroit. Her story is a clear example of the trend of low-wage, part-time work leaving families unable to subsist. Rose was already working part-time when her hours were drastically reduced. To supplement her income, she wants to take on side work cutting hair but can't even afford the barber tools and supplies to start. This trend in employment of low-wage workers on a less than steady basis leaves about a third of the country without sufficient or predictable income to meet the cost of housing, food, transportation and necessities. Rose is a testament to how hard that is from day to day, year to year, particularly for families with children. We can help Rose get barber tools to augment her part-time income, Sheree get the laptop she needs to study to be a Social Worker and progress towards full-time employability, and James get the tools he needs to start a job as a welder. Beyond that, we need to recognize that it's time to open a real conversation about the way underemployment practices in the U.S. place an undue burden not only on families but on public and charitable systems straining to meet the needs of families living in poverty. Food stamps, food pantries, housing subsidies, homeless shelters, and free and reduced lunches for low-income kids in school are just a few of the costs that go up when secure employment falls away. Underemployment is expensive in dollars and even more costly in terms of its impact on children of under-employed parents. We need to make discussing and addressing this imperfect imbalance a priority.